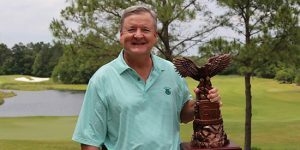 THE WOODLANDS, TX (May 3, 2018) – Mike Booker became a four-time Carlton Woods Senior Invitational champion on Thursday, shooting his third straight under par round and pulling away from the field at the Fazio Course at Carlton Woods. Booker, who won the event in 2011, 2012 and 2014, took a one-shot lead into the final round with a 69 on Wednesday. First-round co-leaders Lawrence Field (Tulsa, OK) and Scott Smith (Houston, TX) were one shot back.